Performing to sold-out audiences nation-wide, Let’s Hang On! 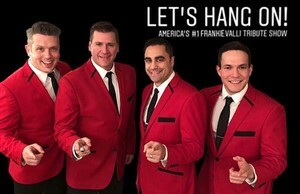 has established itself as the premiere experience to Frankie Valli and The Four Seasons. Capturing the iconic sound with crisp harmonies and sleek choreography that are sure to take you on a trip down memory lane with some of the best music from the 1960’s.